It turns out that Defense Secretary Robert Gates wasn’t the only member of the Obama Cabinet with a STFU policy. 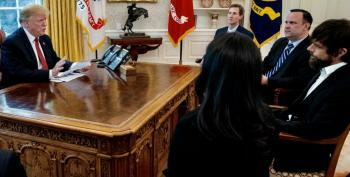 At a press conference earlier that day, Holder had told reporters that the administration would push to reinstate the assault-weapons ban, which had expired in 2004. The comments roused the powerful gun lobby and its water carriers on Capitol Hill. ‘Senators to Attorney General: Stay Away from Our Guns’ read a press release issued by Senator Max Baucus of Montana-a Democrat, no less. The back story on this is important. 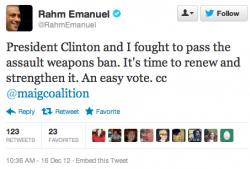 Emanuel, as a congressman who chaired the Democratic Congressional Campaign Committee (and as such helped recapture the House) came to understand that for many Democratic members of Congress is swing districts, supporting gun control was a liability. The “majority makers,” as then-Speaker Nancy Pelosi came to call them, were often from rural or blue collar districts where the NRA was active. Yes, Rahm was the guy who packed the Congress with so many Blue Dogs, he made sure we couldn't get any progressive policies passed. In fact, he went out of his way to sabotage any real Democrats who were running.